Hantres pronounced HAN-tress, also called barbounofassoula, is a type of kidney bean with a pink speckled skin that turns brown when cooked. The name hantres in Greek, means beads. When these are fresh and green they are called fassolia barbounia (runner beans) Phaseolous Coccineus which are a hybrid of Phaseolous Vulgaris (the common bean). When they are ripe their pods become beige and red and inside the beans are off-white with red markings. However, when cooked they loose this lovely colour. This is a recipe from last summer and I’ve been wanting to post it for a long time but I wasn’t sure of the name of these beans in English. After asking for help on Facebook, I found out that they are called Cranberry Beans or Borlotti beans. As I was a bit confused about the name, I continued google searching to find out what the English name is for these beans I found a couple of different names. According to Wikipedia, cranberry beans originated in Colombia as the cargamanto. The bean is a medium-large, tan or hazelnut-colored bean, splashed with red/black to magenta streaks. A new cranberry bean variety, Crimson, is light tan and speckled maroon, and is also resistant to viruses and has a high yield. Crimson is a new cranberry dry bean. Borlotti beans, also known as Roman beans or romano beans (not to be confused with Italian flat beans, a green bean also called “romano bean”), are a variety of cranberry bean bred in Italy to have a thicker skin. It is very popular in Italian, Portuguese and Greek cuisine. Pinto beans look the same as cranberry and borlotti beans, but differ in taste. They say a picture is worth a thousand words, so here is a picture of the beans for you to have your own conclusions. I am still continuing my diet and I am now minus 13 kilos. 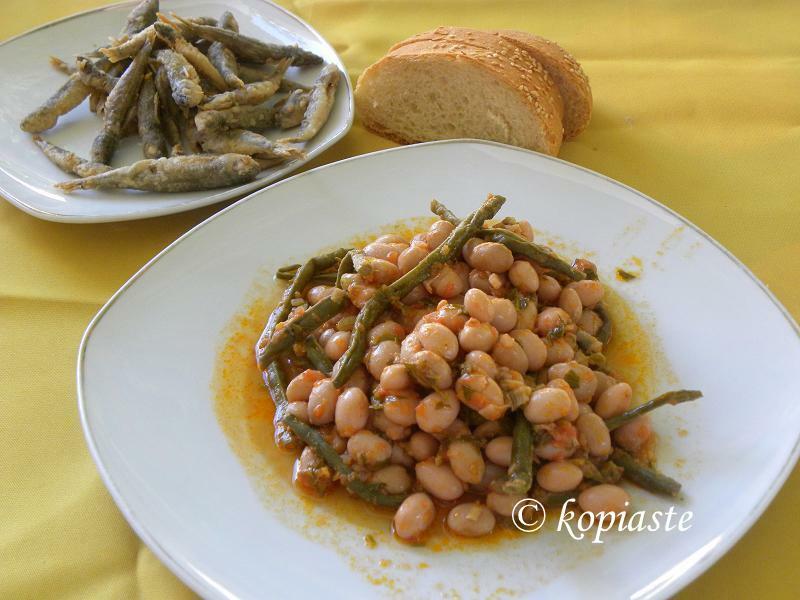 This is one of the dishes I enjoy as they are delicious, with a meatier texture than common beans and a good source of protein and fibre (see Borlotti.com). At the end of summer, these beans are quite cheap, so last summer, I bought some and after cleaning and washing them, I drained them and divided them into portions for 2 persons. I stored them in the deep freezer and today when I was cleaning the deep freezer, I found the last batch. which I cooked, in a slightly different way. I boiled the beans for ten minutes and drained them. Then I added olive oil to a small pot and sauteed 2 green onions. I added a crushed roasted garlic and the beans which I mixed for two minutes. In a food processor I pureed 5 small fresh ripe tomatoes, which I added with an organic vegetable bouillon, salt and pepper and about 1/4 cup water, just to clean the food processor from leftover tomato. Afer boiling point, I lowered the heat and let them simmer for half an hour. I turned the heat off and mixed in 2 tbsp fresh dill. Hantres also called barbounofassoula, is a type of kidney bean with a pink speckled skin that turns brown when cooked. Add the barbounofasoula (borlotti beans) and mix Sauté the onions and garlic until translucent and add the green beans (ampelofassoula) and mix them for a few minutes. Add the tomatoes, salt and pepper and vegetable stock or water to cover beans. Bring to a boil, lower heat and close with the lid. Simmer for about an hour. Shortly before turning off the heat, add the parsley and cook for another 2 to 3 minutes. Congratulations on the weight loss Ivy…well done! And keep it up! I love Barbounofassoula (especially when my mum prepares them). That dish looks really good and healthy! Very tasty. Indeed these look identical to the borlotti beans that are so common in Italy. I am a huge fan of beans, I wish I could get them fresh here.. I love hantres, they are such flavorful beans. I prepare them almost the same way as you. They look incredibly appetizing Ivy. Ivy well done on your grea weight loss! Hi Ivy, happy to read you again!Really inviting one! I have been enjoying fresh beans as well. They are not easy to find here, so when I do, I am excited. Very nice dish with borlotti. And congratulations on your milestone. I have definitely seen these beans at the farmers markets in Portland this summer but you eat the entire bean – not just the center part. They are beautiful and wow, I love the greek name for these. I love how you prepared them as well. You know my Aunt Mary makes beans like this and every time I try they just never turns out like hers, which are the best. I'm gonna check your recipe next time! Ps. Thanks for commenting on my blog -challenge for 7 links. Hope you get the chance. Thank you Rebecca. Nice to meet you. Ivy, I never seen these beans…they are so pretty…and the recipe looks gorgeous, so tasty. Recipie and description of the sublime. Borlotti beans are one of my favorites! I only wish they kept their color after being cooked. They sound great in this dish with tomatoes. I do love a good bean recipe – they are filling and hearty and delicious, and this recipe sure fits the bill. ivy,thanks for your visit and comment! :)and congrats for your weight loss,you are fantastic! October. Used as a meat substitute with a meal of cornbread and canned tomatoes from the garden. to shell the bean from the pod. Have a very rich meat taste. 13 kilos! Wow! Congrats! You must feel fabulous! And these beans are a favorite in our house. They are quite common in France and my husband makes them the French way which is very similar to your recipe! Delicious! I love beans! Congratulations, Ivy! It is so hard to lose weight. Great job! Wow, congratulations on your weight loss. I wish I had your will power. Love the simplicity of this recipe and shall look out for them. I tried your recipe and we loved it! Looks very delish Ivy – love to try new bean recipes. I tried before your fasolia gigante recipe and now it’s a family fav! have nice day! Ps. Recipie and description of the sublime. Inviting,nutritious dish.. And congratulations on your milestone. What a fabulous recipe. Made this with dried beans that I soaked overnight. Didn’t have any green beans, however would be a fantastic addition. I love to eat beans. this dish is really looking yummy. thank you for telling new recipe. The steps are cleared very good way. Wow, wish I had a plate of these delicious beans for dinner. I’ve been making this every summer since, whenever I can find fresh cranberry beans. This dish is just fantastic, and I love that I can get it started when I get home from work, then just let it simmer while I go about my business.